Celebrate the arrival of summer with hot ribs and cool jazz. 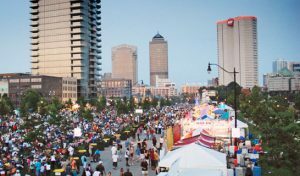 The 33rd annual Columbus Jazz & Rib Fest presented by the Columbus Recreation and Parks Department returns to the Arena District riverfront on July 20-22, 2012. Three stages will host the finest locally and internationally known jazz artists, while barbeque pit masters serve up sizzling ribs, chicken and more. Savor the best ribs from around the country as 23 award-winning barbeque teams compete for “Best Ribs” bragging rights. The aroma of hot ribs and sounds of cool jazz will fill the air on July 20 and 21 from 11 a.m. – 11 p.m., and July 22 from 11 a.m. – 8:30 p.m. Admission is free.